Sporting buttons galore, multiple learning modes, support for 8 devices, and with 800 device codes built in, the Clicker is the ultimate man’s man remote. Did we also mention it’s a bottle opener and hefty enough to bash zombies in the head? If you happen to fall asleep with this remote in hand and it goes crashing to the floor, you better worry about your floor because this remote is very sturdy and designed to open bottles and chew bubblegum, and it’s all out of bubblegum. 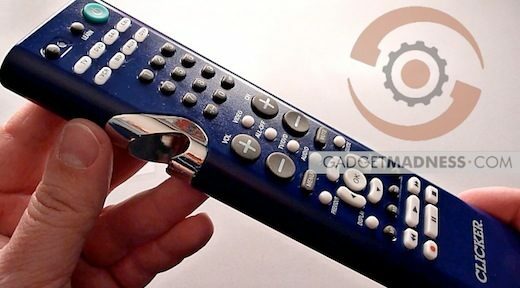 The good folks at Clicker sent us a sample unit of their bottle opener universal remote control for review and after many soft drinks opened and countless hours lost to watching mindless television, we don’t hesitate to recommend the Clicker one bit. Highly recommended!